Meet our Herbie of the Week, Crystalyn! 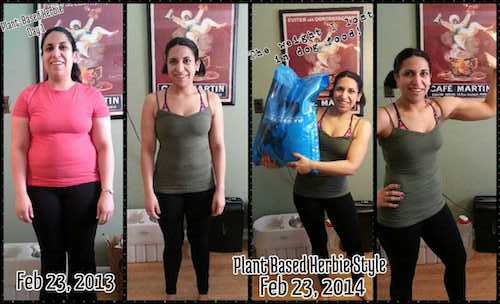 A couple months ago, Crystalyn posted a before and after picture on the Happy Herbivore Facebook page. Her transformation was incredible, so of course I had to ask her to be part of the Herbie of the Week series! After years of struggling with her weight, Crystalyn turned her entire life (and health) around by switching to a plant-based diet in 2013. 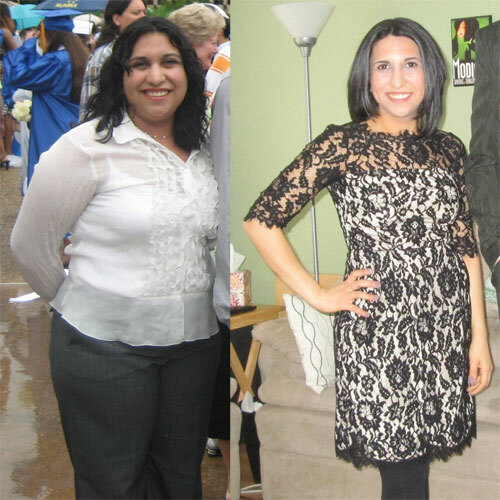 In less than a year, she lost more than 30lbs and lowered her cholesterol by more than 65 points! Here's Crystalyn's story in her own words! To properly explain my plant-based journey, I have to start at the beginning of my growth toward health. My relationship with food has been everywhere on the spectrum. Most of my childhood I didn’t struggle with overeating or weight, but my home did not include the healthiest of diets. In my teens, as I became less active, I began my struggle with weight and food. After gaining 40 lbs at around age 16, I began my years of yo-yo dieting, losing and gaining anywhere from 20 to 50 lbs over and over. At one point in college, I became so obsessed with controlling my diet and limiting my portions to such small amounts that I would be starving at the end of the day, and then proceed to gorge myself in the evenings. 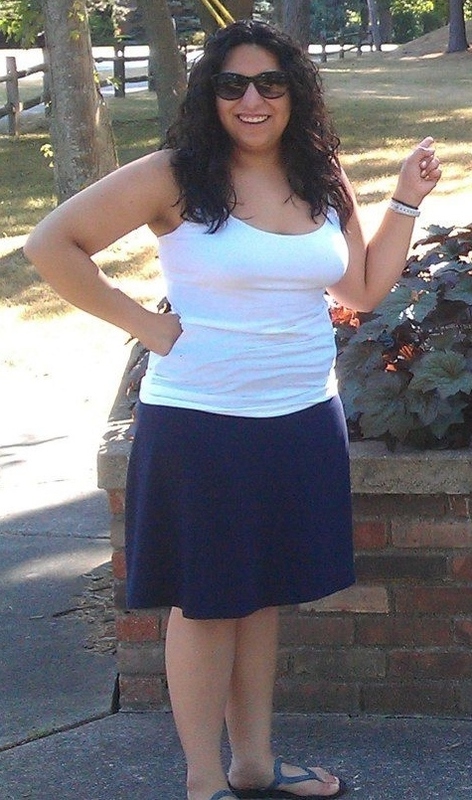 At one point my 5’0” frame was 100lbs, size 0, and miserable. I endured that horrible existence (a diet of mostly lunch meat and cereal) for two years before again succumbing to the “who cares” mode again. Around this time, I was also in the throes of my battle with alcoholism, at the ripe age of 21. By age 23, I eventually ended up at a point where I drank almost all of my calories, eating just one small potpie every two days. Even so, I still ballooned to 181 lbs., and my face was swollen from malnutrition, as you can see from my photo (above, left). I mention this period of my life because it was the crossroads and the turning point that led me to a path of growth and progression. In 2007, at 24, I began my long journey to a healthy life. I got sober. A year later, I quit smoking, too. I wasn’t struggling with eating too much (though I wasn’t eating healthily either), but somehow my mistreated body had no idea what to do anymore, and it clung to all the pounds. I sat anywhere from 165 to 140 between 2007 and 2013, constantly confused with why everyone I knew ate less than me but didn’t struggle with weight the way I did. I tried eating more healthy foods with leaner meats and I tried less calories, but nothing worked consistently. I eventually settled with the idea that my body would just be bigger. And I became OK with that. Growth. In 2012, I watched Food, Inc., and no longer felt comfortable purchasing meats. My husband and I began only eating meat when we went out to eat. Dairy became a welcome substitute. In February 2013, everything changed. My husband and I came across Forks Over Knives. I don’t remember if he recommended it or if I did, but we decided to watch. We took note of the gentleman in the video that said he noticed a difference after three weeks of a whole-foods, plant-based diet, and we decided to give it a try. We took a whole week to eat all perishables that were off-limits, and I organized our kitchen and started the research. I bought books about plant-based diets with guides about how to prep a plant-based kitchen. At the end of the week we donated all off-limit foods we could to my husband’s coworkers, threw out the rest of the perishables, and boxed and hid everything I thought we’d probably want back when the trial was over (mostly oils!) in the back of our pantry where they couldn’t be seen or grabbed. I bought tons of pantry staples, spices, and grains recommended by one of the books (and what a GREAT tip that was! ), and created a meal plan a week in advance to be sure that we’d have no excuses to back out. Then I stocked the kitchen with all the food we needed. On February 23rd, my husband and I took photos of ourselves and started our plant-based journey. The first thing I noticed was how hungry I was! For the first week, I couldn’t eat enough. It was all 100% plant-based whole foods, but I seemed to need so much! I didn’t attempt to control this, and I’m glad I didn’t. In retrospect, I know that I needed to let my body figure things out for itself. By week three, plant-based eating started to feel normal. I began noticing my increased energy. I felt weightless. My hunger evened out, though I noticed I still needed to eat more food than I used to. (I still do!) My husband and I decided to expand our experiment through a fourth week. By the end of the fourth week, I actually started CRAVING the good foods I was eating! They satiated my hunger so completely. That was when my husband and I both realized it was a lifestyle we wanted. Something inside me changed, too. My confidence went through the roof before the weight was gone. It was like, I knew I was being good to myself and growing in such a healthy way, and it just made me feel great. At about six months in, I went to my doctor and had a blood count taken, almost exactly a year after my last blood panel. My results were stellar! My cholesterol dropped from a high normal of 186 to 117, and my LDL (bad cholesterol) dropped from 102 to 55!! Everything else was tip top. I already knew that I felt better, had more energy, thought more clearly, and felt lighter on my feet, but then I discovered my insides were just as happy as my outsides were looking! Another bonus I’ve noticed is my ability to retain information has increased, and I learn more quickly. I am a classically trained singer, and have always struggled with the memorization of music. It would just never stick! About seven months into my plant-based life, I began singing with an opera chorus in Detroit, and the strangest thing happened. I was suddenly able to learn my music so much more quickly and easily than ever before. I could practice for an hour and the notes just somehow lodged themselves into my brain, whereas it used to take a few days to achieve that kind of memory. Around the same time, I also began a graduate program in accountancy. Studying has always been a challenge for me. I used to read and read and read, then forget (OK, let’s be honest. I only sometimes studied diligently in my undergrad days! But still, I never understood why it took YEARS for new skills and knowledge to stick.) But now I remember things and it’s showing in my grades. I received a 4.0 and a perfect numeric average for my first semester, and I’m continuing to do well. I have to credit some of this success to my plant-based lifestyle. Plant-based living has opened my world to more growth than I would have thought possible. The energy I now have has left me craving more ways to grow. And much like Lindsay, I’m all about progress not perfection. In fact, my yearly New Year’s resolution for the last seven years has been “to continue to grow.” I feel like plant-based living has given me more opportunities to do that, not only for myself but for others. With the energy that I have, I can improve myself in order to be more available to help others. I can continue to improve my health by adding in workouts that don’t drain me. I can be more humane and loving to animals, not just my pets at home. I can make a smaller carbon footprint. And Lindsay and Happy Herbivore have created a great nest of goodies that have helped me immensely. About 90% of the meals I make come from Happy Herbivore cookbooks. (I own all four!) What can I say? She makes it soooooooo easy. All of the ingredients tend to revolve around the same staples I always have in my home, and yet the recipes are all so different and full of flavor- and best of all, quick! I know that a lot of people worry about how hard it is to eat plant-based, and believe me, I struggled in the beginning figuring out what ingredients I needed in my home at all times and searching for good recipes, but after a few months and once my kitchen was well equipped, I realized that eating this way and making meals in my home is so much more simple. And dishes, without greasy residue, are so easy to clean! I’ve also caught on to the minimalist movement Lindsay leads. Plant-based living has simplified so many facets of my life. Eating is simple. Plentiful energy makes things simple. Good health means less stress which equals simple. And now I’m trying to apply that to more areas of my life. Simplicity is beautiful. Life is so amazing and bright, why not minimize it and let each light in my life shine brighter? I can’t thank Lindsay enough for her support. I’m the kind of person that needs inspiration to even dream of new possibilities. Lindsay (and her crew!) are some of my inspirations. I hope, in some small way, my experience can pay their efforts forward to those I come across in my life. Most of all, I’m excited about living a long, healthy life with my main squeeze: my awesome husband, Eric, who also celebrated one year of plant-based living with me this past February! He’s been a great ally, and he’s inspiring to me as well. An active-duty soldier in the Army, he will most certainly be in situations where maintaining a plant-based lifestyle will be difficult, and, in the right circumstances, even impossible. But he’s worked hard to maintain it. He has recently returned from a month long stay in another state for an Army course, and while he had the option of eating omnivore food for free in the chow hall, he chose to eat the few plant-based foods that were available in the cafeteria and supplemented it with plant based foods he kept in his hotel room with a mini-fridge, microwave, and a few utensils he brought from home as his only means for cooking. If he can do it with a microwave and a Gerber knife, anyone can! For me, plant-based living has had such a domino effect. The growing part. The healthy living part. The minimalist part. The sum of all parts equaling more serenity and peace. Life is good, my friends. I am so excited to see what happens next! What a beautiful story! Thank you so much for sharing your journey with us, Crystalyn!